The robot assistants we were promised as children are finally ready for the home. Well, sort of. Instead of walking, talking humanoid automatons like Rosie from The Jetsons and Robby the Robot from Lost in Space, our well-spoken helpers are housed in plastic and sit on tables. They answer our questions, control our homes and sometimes tell us a story. The most ubiquitous assistant so far has been Alexa, an Amazon-powered attendant that has made the jump from a $180 tower to the $50 Dot, which isn't much bigger than a hockey puck. That sort of drop in size usually results in a loss of features. In this case, you're going to want to go tiny. 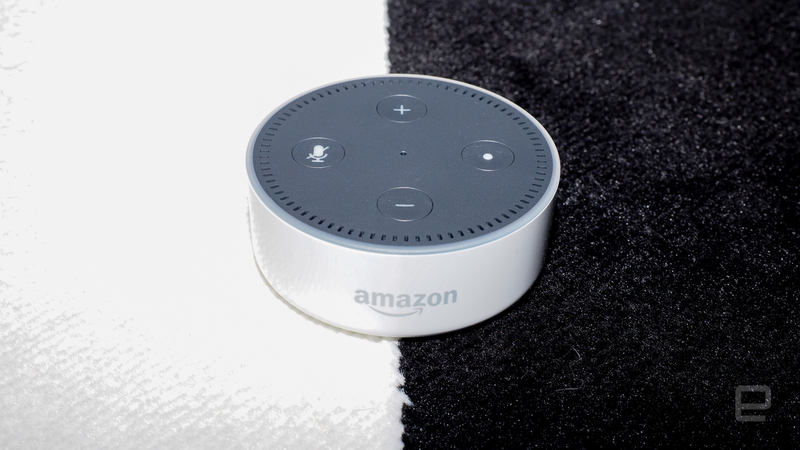 The Dot is a smaller yet just as powerful version of the Amazon Echo. What it lacks in an internal speaker system it makes up for with an audio-out port and Bluetooth connectivity. 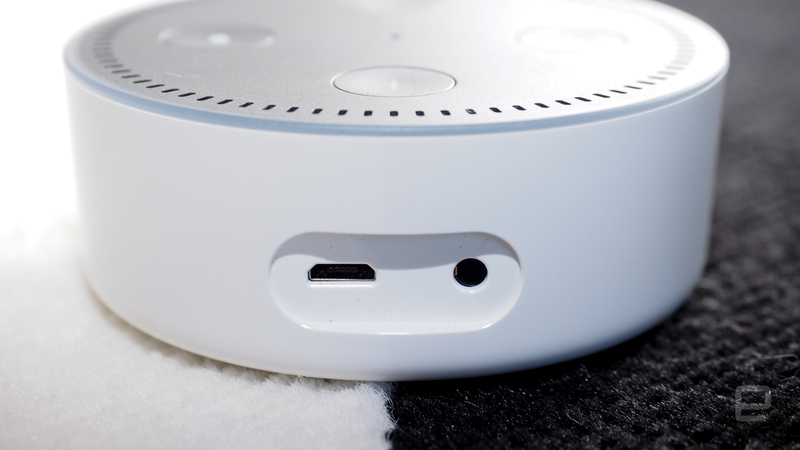 While the app and inability to route queries to a single Alexa device within close proximity of each other can be annoying, the $50 price and Alexa's usefulness make the Dot a solid option for anyone who wants to start building a connected home on the cheap. 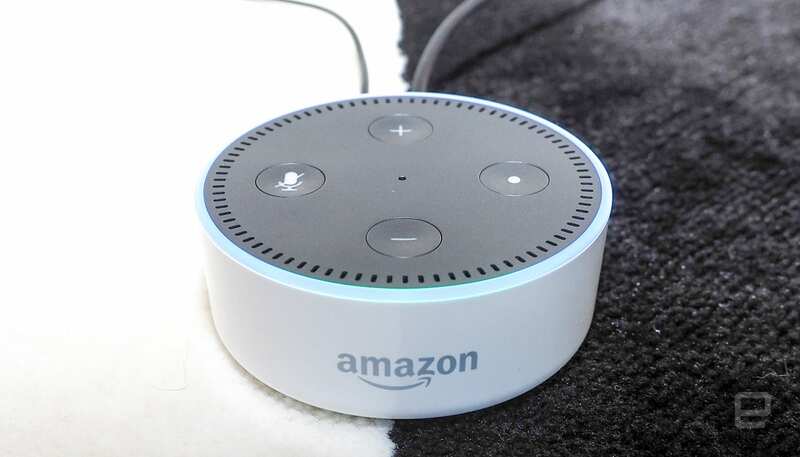 Be the first to review the Echo Dot 2nd-gen? At only 1.3 inches tall, the Dot (available in black or white) virtually disappears into your home. It can be placed anywhere, and it won't disrupt your carefully decorated room. Like the larger Echo, the second-generation Dot can be used to fill an Amazon cart. But that's not the only thing people use it for. 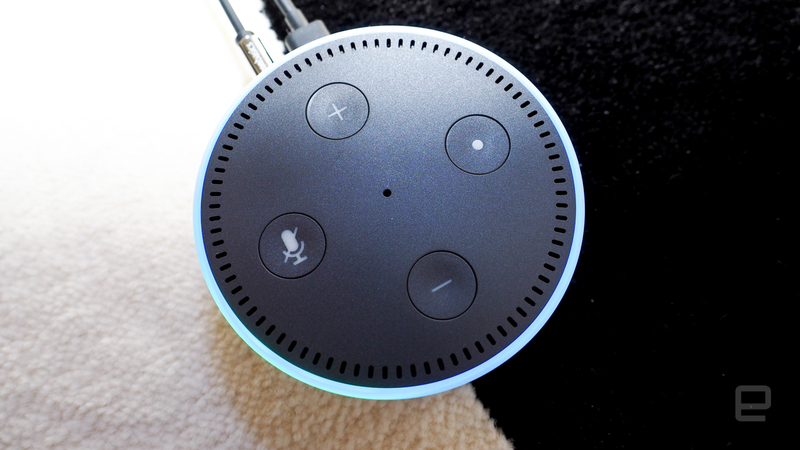 Instead, the Alexa platform is an incredibly helpful connected home hub, a fountain of random facts, an audiobook reader and a music player. Indeed, it's music where the Dot really shines, thanks to an audio-out port and Bluetooth speaker support. That gives it access to nearly any audio system in your home. The full-size Echo's built-in speakers sound fine too, but the stereo system I already own sounds better. Also, you can switch between wired and Bluetooth speakers on the fly by enabling and disabling the Bluetooth connection with your voice. That feature allowed me to switch my audio source in two different rooms using a single Dot. That said, the Alexa platform does work with Sonos if you want that type of audio system and you have the money. Unfortunately, you can't play audio out of both a wired and a Bluetooth source at the same time. Like the Echo, the Dot has an internal speaker, but it's too anemic for audio playback to be truly enjoyable. 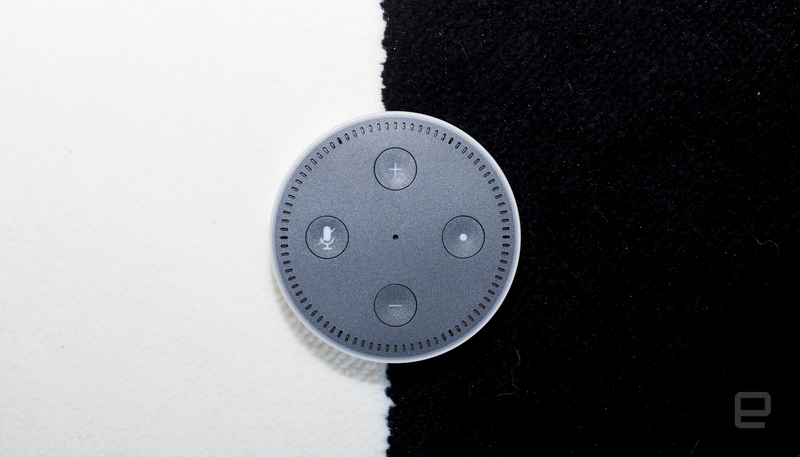 And while about 90 percent of your interactions with the digital assistant will be voice-based, there are physical buttons on top of the device as well. The most important of those is Microphone Off, which, as you'd expect, stops the device from listening for the "Alexa" wake word. It's a great feature for when you want to discuss sensitive topics and you're feeling a bit paranoid. Indeed, there's good reason for being cautious with sensitive material: Sometimes the Dot and Echo think they hear "Alexa," even when that's not what you said. Now a bit of your conversation has been recorded as a query, sent to Amazon's servers and also stored in the app. Additionally there are volume buttons that replace the full-size Echo's twistable top. Fans of the knob will be disappointed, but most of the time I use my voice to raise and lower the volume anyway. The buttons are surrounded by an LED ring that indicates when the Dot is listening and thinking. It also reflects the current speaker volume. It's a nice indicator that your assistant is listening, and it can be seen from across the room without being too bright or blinding. The thousands of "Skills" (what Amazon calls third-party add-on features for the Alexa platform) are where Amazon has a distinct advantage over Google's forthcoming speaker hub, called the Home. It already supports popular connected-home brands such as Nest, SmartThings, Philips Hue and IFTTT, as well as platforms from WeMo, Insteon, Lutron, Honeywell and Ecobee, among others. Plus it works with travel and recipe apps. You can order a pizza, flowers and a car with it. You can check bank balances and get news briefings from NPR, Fox and the AP. You can hear sports scores from ESPN, and you can even figure out how much gas is in your car using the "Automatic" Skill. I tried nearly all of these (except ordering pizza, because ew, Dominos) and they all worked like a charm. But the Skills library -- like all app stores -- is filled with some add-ons that are better left ignored. For example, the Moon Age add-on notes, "you can know the moon age by asking to [sic] Echo." What does that even mean? Adding all these Skills requires using the Alexa app, which is clearly the weak link of Amazon's platform. I've been using an Echo for more than a year, and in the past few months the app, frankly, has been a pain to use. The issue is that it says it's not connected to the internet, even when my phone and Echo speaker both can access the network without a problem. If it doesn't think it's online, the app becomes worthless. Fortunately, you can also tap into Alexa via your web browser. That workaround has consistently worked for me. But I usually learn of a new Skill while on the go, and if 20 percent of the time I can't add it because the app is buggy, that's frustrating. Another confounding thing is that you can't really have two Alexas in adjoining rooms. Amazon says that its Echo Spatial Perception feature (ESP) determines which device hears you the best and sends answers only to that piece of hardware. But during my tests, the Dot and the Echo both replied and answered when I said the wake word or made a query. Even if I was sitting in front of one of them, if the other assistant heard me, it would react. To combat this, I changed the wake word on one device to "Echo." Those in larger houses with more rooms might have a different experience altogether, though. While there are rumors of an Apple device on the horizon, the only real challenge to Alexa's dominance in this field is the forthcoming Google Home. 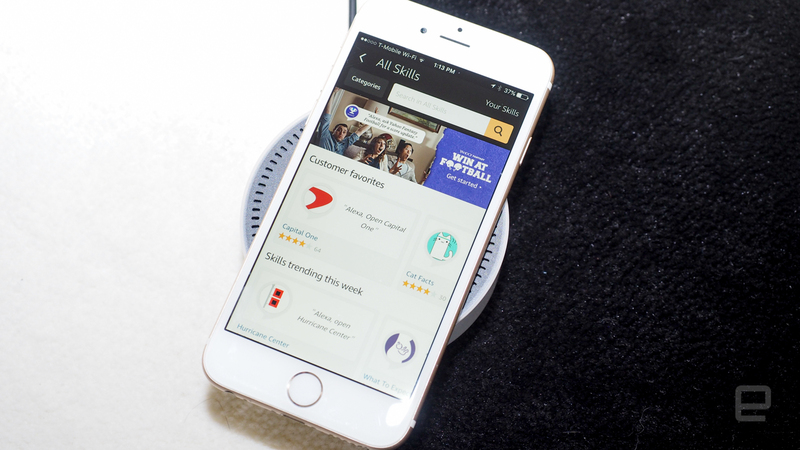 While the Home does have some Internet of Things capabilities, they pale in comparison with the Echo and the Dot. While the Google offering works with four connected home platforms, Alexa supports more than 13 different manufacturers and developers. But the $129 device will allow for audiocasting to multiple devices that support Google's audio and video streaming service. The Dot, meanwhile, can send music only to a single device. The Amazon Dot is also out sooner, but only by a few weeks. It starts shipping next week, on October 20th, while Google Home goes on sale November 4th. Engadget will have a full review of Home once it's available, so stay tuned for that over the coming weeks. Even with multiple wake words, the inability to stream to multiple devices and an app that sometimes fails, the Amazon Dot is an incredible value at $50 a pop. Dropping one in the kitchen and one in the living room seems like a no-brainer. I've used the Echo tower for more than a year and it's one of the only -- if not the only -- IoT devices that actually works as advertised while continuing to gain features. Alexa doesn't roll around the house cleaning up your mess like the home robot of our dreams, but it does make your life better by bringing all your various services and information into an easy-to-use setup. Plus, thanks to the audio jack, the $50 Dot is a much better value than its taller cousin. Just don't call it Rosie.